This week, we have heard of a case in Sydney was heard by a Beth din of three melbourne Rabbis. One of the Dayanim of that Beth Din, ruled that since the Sydney person who lost the case should be marginalised for not following the ruling. Apparently, as part of putting this marginalisation it was decreed that the Sydney litigant’s offspring should be denied access to a Jewish School. I’m assuming this is all true and accurate (it came from the Australian Jewish News, so I don’t know how correct it is, of course). Next, there is the Cherem published by the Sydney Beth Din on a well known Melbourne Toen (halachic advocate) because the Toen is alleged to have besmirched (according to the Sydney Beth Din) one of their Dayanim. Toanim are paid. They can be quite aggressive and often lack the correct demeanour to make sure the process is calm, and properly dealt with, in an atmosphere of heat reduction. Now, I’m not getting into the rights and wrongs of either case. Don’t allow any Toanim. Have it so that both litigants (and any witnesses) alone, interact with the Beth Din. If they want to have a private meeting with a Toen before the Din Torah that’s fine, but they need to keep the Toanim as simply an advisory service. In the end, the Dayanim should know what to ask and see through any halachically unsound claims. At the moment, we have an unedifying situation where the honour of Rabonim in Melbourne and Sydney is besmirched. Halachic Judaism is besmirched. Public campaigns to show that some Rabbis disapprove are needed to smooth the waters in the press. It’s not what we are about. We need to restore Kavod HaTorah. As being slightly familiar with the second situation, I must point out that the problem extends beyond respect and honor. A long standing institution in Melbourne is having to deal with a Rabbi in Sydney. This Rabbi believes that he has jurisdiction over the Australia, and apparently the whole world. After he was hired as a borer for one side, he overnight decided that he will be the Dayan and that the case will be heard in his Sydney based court! This is a situation that must be put to an end. Over the past few months I allege that he has been threatening the institution, its Rabbi and executives, with various forms of siruvs and niduis etc. The Toen merely wrote an email to the administrator, with a number of reasons why the said Rabbi is way out of line, basically telling them tzu zich oplozen and not waste anyone’s time. Ignoring all the other issues enumerated in the letter, the said Rabbi “ongechapt on a vort”, and put the Toen in ‘nidui” for besmirching his Beis Din. True the Toen could of been more respectful, but the core issue is not respecting Rabbanim, rather it is whether the good people of Melbourne and the world could be able to continue to tolerate the antics of the said Rabbi and his (world) court, currently based in Sydney. I apologize if I wrote a little harsh, but i am glad that people are finally calling his bluff. Notwithstanding what you wrote, Toanim need not be aggressive in a Beis Din. They must show reverence for Dayonim because that is Kavod HaTorah. If they believe that a particular Beis Din is not properly constituted because a Dayan isn’t allegedly qualified, this needs to be dealt with quietly and respectfully through the aegis of an agreed third party. There is way too much public grandstanding. Sure, a Toen wants to show that he is useful. It’s his business. My contention though, is that they are, in the main, damaging Kavod HaTorah when they behave like cowboys. Even a Toen knows when his client is effectively guilty. He tries to identify opinions that may assist, but in the end, I ask you, what if a Toen thinks there is no Yashrus in the case of his client. Should he tell him or should he take his money and throw spurious and not accepted opinions every where and try to befuddle the case? In the end, Titen Emes L’Yaakov. Sure, let the Beis Din decide, but the atmosphere around the world seems to be overly adversarial and less interested in Emes and Kavod HaTorah. The said Toen’s offensive letter, was of a private email sent solely to the administrator of the SBD, telling them to stop sending useless threats to the YC. What has been clear to you is plain nonsense. 1. You have to use Dayanim from outside of Australia, only if you want the beit din to Pasken “Al Pi Din Tora” – or “Karov L’din Tora”, and the reason for the need to bring Dayanim from overseas is that it is hard or even impossible to find people that know Shulchan Aruch Coshen Mishpat. 2. there is a need to use Dayanim who live or have lived in the western, if the dispute involves a legal contract, and there is a need to be educated and being able to read English, or understanding a legal document, and not having to ask the other Dayanim all the time “woos meint doos”, as I saw in my own eyes in the Mond case. before an arbitrators decision becomes a court ruling it must approved by a judge, and before it is approved each side can object to the a arbitrators ruling on a few grounds, and some of them are that the arbitrators acted not according the arbitration and conciliation act, or that the weren’t impartial, and as I was told that Amzalek is objecting to the decision of the Dayanim/Rabbis on those grounds. May I add that I hope that the Dayan that decreed that the Sydney litigant’s offspring should be denied access to a Jewish School, is not going to be warned by court that his action is illegal, as was rabbi Abraham in the Mond case. If you use Dayonim, from the Beth Din of America then they have already been court approved the world over. We need quality interlocutors and a clean system and it won’t be done in Australia nor can it be handled by a closeted Charedi Beis Din which is only remotely connected to this world, and certainly not our world. I agree with you, but may I posit that at a time when people are becoming more and more cynical about the antics of Rabbonim worldwide, especially regarding the carrying out and covering up of molestation, and also fraud, theft, corruption etc, that it becomes unbelievably laughable that the only tangible action of Rabbonim in Australia has been to put someone in Chairem for calling a Rabbi a “Mr”. Perhaps it’s all a Purim joke. We need to look at Rabbonim differently too. We are way to casual and friendly with them. We expect them to drink and eat with us, and be “mates”. There has been a cultural shift, largely due to outreach efforts. When was the last time you saw a Rav walk into a Shule and congregants stand up? Sure, the Rav can be Mochel, but let him be Mochel. Today, there is absolutely no respect for Torah even before the fraud and lack of action on abuse. I learned respect for Rabbonim from Holocaust survivors who didn’t keep Torah and Mitzvos in the main! Yet, when a Rav came past them, they stood up. This is also due to the binary system of “Rebbe” versus the rest. It’s wrong. There is a hierarchy, even if there is a Rebbe who is greater than his Chassidic Rabbonim. I cringed, when I saw a picture in the Jewish News this week of a Rabbi, going through the motions of starting off a fun run (for a good cause). Ad Mosay? Is there anything people don’t do for Gelt these days? You are right, many people have no respect for Torah, Rabbonim and their fellow man. (Isn’t that what they say will happen before Moshiach comes?) Perhaps this is the reason why there are so many misdemeanors these days, no-one cares. No empathy, no sympathy. And when the Rabbi tells them to shut up during Kriah they laugh at the Rabbi. How many people answer Amen when you say Kaddish on Shabbos? etc etc. Yet the non-frum jump up to answer Kaddish. And now Sydney is putting Yeshivah (Rabbi Telsner?) in Cheirum. These Purim jokes are so funny. It’s meaningless sadly. It’s like throwing snow at each other. please explain for what and by whom are the Dayonim, from the Beth Din of America are already been court approved the world over. They are not more than an approved Beth din in America and not an approved court in Australia, do you want to tell me that they are approved by the Australian government to judge Australian citizen? In Australia and all over the world every person can be an arbitrator, that his ruling is approved by the courts as long the parties sign an arbitration agreement, and being “approved” by the world over or under doesn’t add even a bit to their ability to arbitrate. To be able to have a quality system and not a system where people that know nothing, care about nothing. Who watch who is behind them when they bend over, you need quality people to run the system. people stood when a Rav walk into a Shule, when they saw a Rav that behaves as a rav walk into a Shule and not somebody that behaves in a way that doesn’t add much to his honor. I’m suggesting the Beth Din of America is a widely recognised and experienced Beth Din. The lawyers know more than contracts. IF someone applied to have say the Av Beis Din (who I have met and who is not beholden to mafioso askanim) why wouldn’t a judge accept them as an arbitrator? SOME Rabonim have list respect because of their actions, but many deserve respect and don’t get it because people simply don’t have kavod hatora. They yap during layning! why wouldn’t a judge accept them as an arbitrator? A judge will accept any arbitrator, as long both parties to a dispute agree that he should arbitrate. Restricting Challenges to the Arbitrator on Grounds of Bias. In accordance with the UNCITRAL Model Law, the Act now provides that the identity of an arbitrator may only be challenged where there are “justifiable doubts” as to his or her impartiality or independence, or if he or she does not possess qualifications agreed to by the parties. The test for whether there is “justifiable doubts” is whether there is “a real danger of bias” by the arbiter. By contrast, the traditional common law test for bias under Australian law is whether a fair-minded objective person would reasonably apprehend that the arbitrator may not be impartial. you dob’t need a rov or dayan to settle a dispute. you may even use a non jewish professional to settle a depute, and there isn’t any problem with arkaot, if you are not going to an official court. you witnessed the absolute farce of ETTC vs YHT case, and I together with you and the whole community witnessed the absolute farce of the Mond vs Caulfield Hebrew Congregation case, you didn’t have to be a professor of law to understand how the Dayonim had so little respect for the law, for public money, honesty and truth, or fear from a Chilul Hashem. Why was it that you didn’t see even one of the city rabbis criticizing in public the behavior of the dayanim? Was it because they thought that the Dayanim acted in a proper way, or they didn’t want to critisize their mates, is it a surprise, that when people have a dispute they go to the courts and not to a Beth Din? Only when the people who are able to make a change, will stop blaming the askonim or the weather for the חילול השם, and they will realize who are the “real” people who are causing a חילול השם with the way they handle cases of dispute, there is a chance for a change in the attitude of the public towards the institute of a Beth Din. היועץ המשפטי לממשלה פרסם היום (ג), הוראה לפיה יש להתייחס ל’כתב סירוב’ כאל עבירה פלילית. פרסום הנחיית היועץ בא בעקבות תלונות על בתי דין פרטיים שהוציאו “כתבי סירוב”, שנועדו למנוע לפנות לערכאות ולרשויות המדינה. כתבי הסירוב כללו איומי חרם או בנידוי, וסנקציות חמורות או איומים בנקיטת סנקציות, אשר לעיתים הופנו לא רק נגד מושא כתב הסירוב, אלא אף נגד בני משפחתו, ובהם ילדיו. היועץ המשפטי לממשלה קבע כי הוצאת כתב סירוב המכיל סנקציות חברתיות, גינויים ואיומים בחרם, עלולה להוות עבירה פלילית של שיבוש מהלכי משפט, הדחה בעדות, הדחה בחקירה והטרדת עד, וכן, במקרים החמורים יותר, אף עלולה לעלות לכלל עבירה של איומים או סחיטה באיומים. “כתבי הסירוב”, אומר היועץ, “נועדו במקור לשמר את האוטונומיה והמעמד של מוסדות השיפוט בקהילות היהודיות בתקופת הגלות, אך כיום בתי הדין פועלים במדינת ישראל, שהינה מדינה יהודית ודמוקרטית”. עקב רגישות הנושא, נקבע כי החלטה על פתיחה בחקירה או העמדה לדין טעונה אישורו של המשנה לפרקליט המדינה. עוד הובהר, כי במישור המשמעתי, הוצאת כתב סירוב עלולה להוות עילה להגשת קובלנה משמעתית, בין אם החותם על כתב הסירוב הינו דיין בבית דין רבני ממלכתי, ובין אם הוא דיין בבית דין פרטי, הממלא במקביל תפקיד ציבורי, כגון תפקיד של רב המכהן במשרה שלטונית או כל עובד ציבור אחר. במישור המנהלי נקבע כי במקרה בו תתנהל חקירה פלילית בעקבות הוצאת כתב סירוב נגד נושא משרה במוסד ציבורי נתמך או מבקש תמיכה, או במקרה שבו נושא המשרה הורשע בעבירה פלילית בעקבות הוצאת כתב סירוב, תיבחן האפשרות לעכב או לקזז את התמיכה הניתנת למוסד, בהתאם להנחיית היועץ המשפטי לממשלה הקיימת בנושא זה. כן נקבע כי גוף ציבורי לא יעמיד נכס ציבורי העומד לרשותו לשימושו של בית דין פרטי המוציא כתבי סירוב, ולא יעשה שימוש במשאביו של הגוף הציבורי לקידום ענייניו של בית הדין”. First and foremost Rabbonim need to earn respect! With regard to sending derogatory letters to a Beis din, crticising their legitimacy and that of a member of the beis din is abhorent.It makes no difference if it was a private letter. It simply reflects the personality of the writer and throws into doubt his own legitmacy as a suitable and qualified To’en. Every beis Din has the right to stand up for itself and not have individuals ridicule them, even if they have to resort to applying charomim etc. A rabbi of a shul should concetrate on his! members of the shul, do the right thing by them and bring the atmosphere of the good old days back. If he cant, then he should do a Ted Baillieu!! But do you issue a Ksav Nidduy for someone who calls a member on the Bais Din “Mr” instead of “Rabbi” and not expect a backlash about the chillul Hashem? Couldn’t the disagreement have been sorted out privately? Show him the smicha and let the other apologise if it exists. What a trivial thing to flex your muscles about. At the same time many Rabbonim worldwide are pubicly behaving badly, with many shules mired in controversy. Shules should not be sending paedophiles overseas to re-offend or spending $5 million trying to stop one person from voting at the AGM, or putting up Yechi signs, which must be against Halacha etc, or teachers beating the crap out of kids etc. It’s all about power and money and kovod. As Menachem said, if you want to be a Rov then do the right thing. I think there was much more than just a ‘Mr’ comment. A Sydney Beis Din issued a Nidui against a prominent Melbourne Rabbinic arbitrator after he wrote the Beis Din a letter challenging their jurisdiction in a Melbourne dispute and accused the rabbinic court of lacking the qualification to hear the case altogether. The Beth Din called the letter gross contempt and accused the arbitrator of defaming the Beis Din. 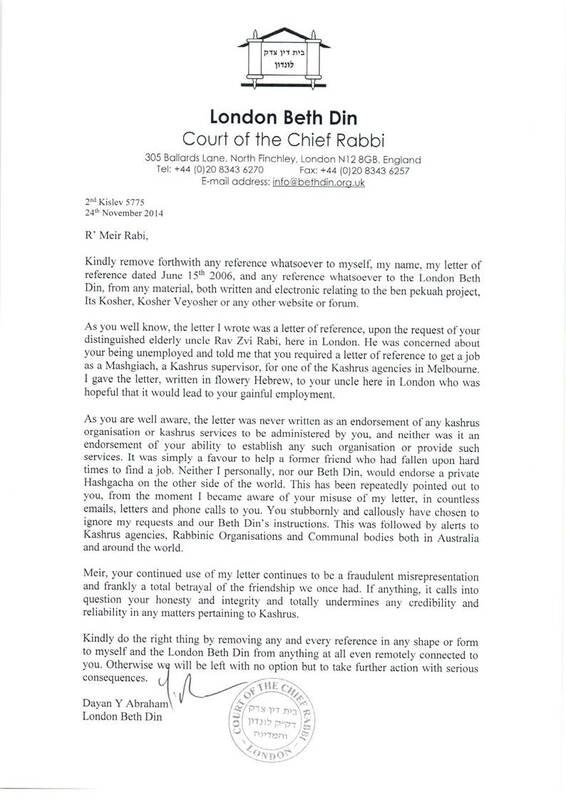 The Sydney Beis Din also threatened the local institution to either dissociate itself from the Rabbi’s letter or face the same consequences. The disputes began after the Yeshiva Center in Melbourne fired a long term employee. The dismissed employee called the Yeshiva Center to a Din Torah claiming he was fired without justification. The parties agreed to a Zablah. The Yeshiva Center chose Rabbi Menachem Kaminetsky from Melbourne and the plaintiff (employee) chose Rabbi Moshe Gutnick from Sydney. There was a disagreement between the parties over the third Rabbi on the Zablah. It was taking a long time for the Din Torah to take place, In the meantime, the Yeshiva Center stopped paying the employee. Rabbi Moshe Gutnick’s (The Rabbi representing the plaintiff) Beis Din in Sydney issued an Ikul demanding that the Yeshiva Center continue to pay the employee or face consequences. Your letter, in the name of the Sydney Bet Din with all its threats to the Yeshiva Centre (Melbourne) was received. However it is a pity you’re wasting time writing such letters. I write this because according to Halacha (Jewish Law) your Bet Din does not fit the criteria of a permanent Bet Din, even in your own city of Sydney. Furthermore, the Sydney Bet Din does not jurisdiction to deal with a Melbourne matter. Therefore all the restraining orders and unilateral demands issued by the Sydney Bet Din, with regards to this proceeding, are not worth the paper they are written on. Additionally, your Bet Din is not qualified to act as a Bet Din altogether. Since Rogut does not have Smicha to be a Dayan. 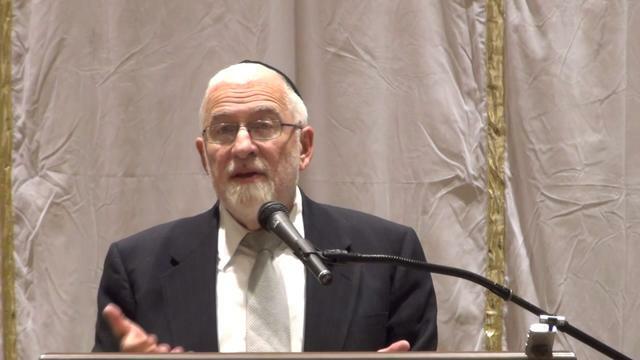 Moreover, Rabbi Gutnik is a related party (since he was appointed by the plaintiff to represent him), and consequently he is not in a position to issue a restraining order. 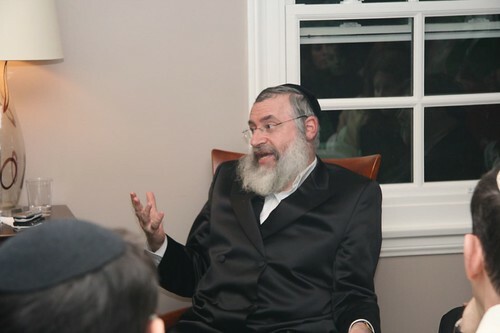 Since the respondents (Yeshiva Centre ) have continually stated that are they were willing to consider the appointment of a Sholish ( presiding arbitrator ) and agreed to the appointment of either Rabbi Ashkenazi or Rabbi Zinner , they ( Yeshiva Centre ) cannot be considered to be refusing to appear before a Bet Din, as is ruled in the Responsa Avoidas Hagershuni Siman 108. Regarding your complaint that Rabbi Zinner is not a Lubavitcher Rabbi, this is a strange complaint. Where in the Code of Jewish Law does it state that a Rabbi must be a Lubavitcher in order to qualify to adjudicate as a Rabbi in a Din Torah?